Magness Blake began to sell the horses off, and by the time she began looking for a new ranch in 2002 with her future husband Ernie Blake, “I only had about 30 horses,” she says. Of the steeds she kept, one was of particular importance: Thunder, the official mascot of the Denver Broncos. 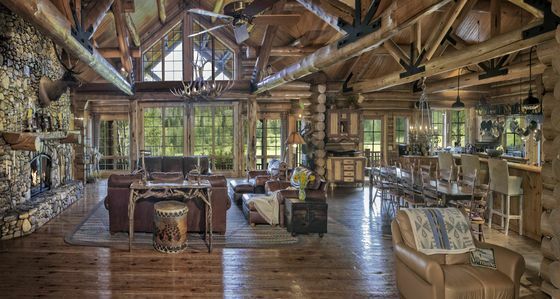 So the Blakes’ new ranch wouldn’t just be for their vacations, it would be for the Thunders, too. 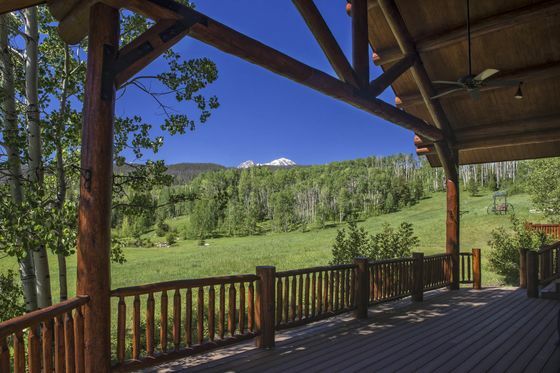 After a search, they found a 255-acre ranch about an hour and a half drive from Denver. It had been developed in the ’90s by two Texan friends who’d each built their own houses on the property about a quarter-mile apart. 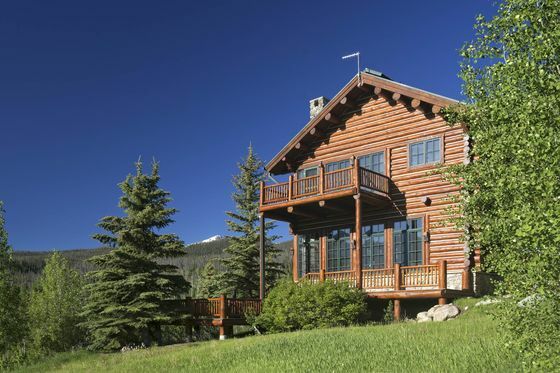 “For us it was just perfect,” says Ernie Blake, a retired attorney and the onetime mayor of Breckenridge, Colo. “One of the houses we call the main house, and that’s our home, and the other we call the guest house,” and use it for their frequent visitors. That Thunder, currently employed as a mascot, grew up on the ranch, she says, though Thunder 4 is training elsewhere. 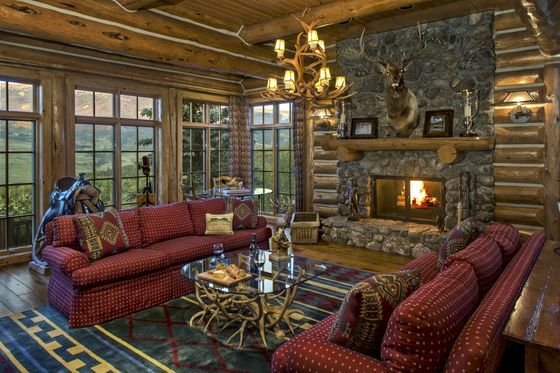 The Blakes, Thunder in tow, would go to the ranch for some relaxation and horse riding, but at this point, Magness Blake says, “we have a huge life in Denver, and we don’t get there as much.” As a consequence, they’ve put the Silverthorne ranch on the market with Jack Wolfe of LIV Sotheby’s International Realty for $23 million. 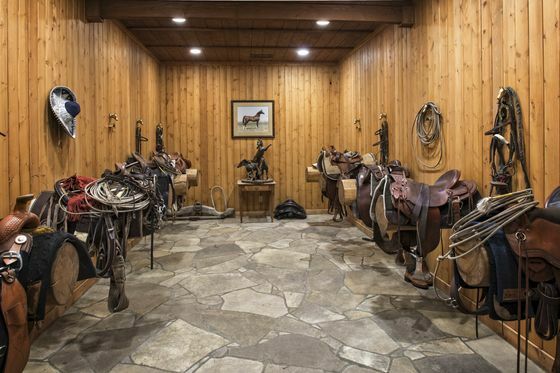 The property is configured with a heavy emphasis on horse riding. 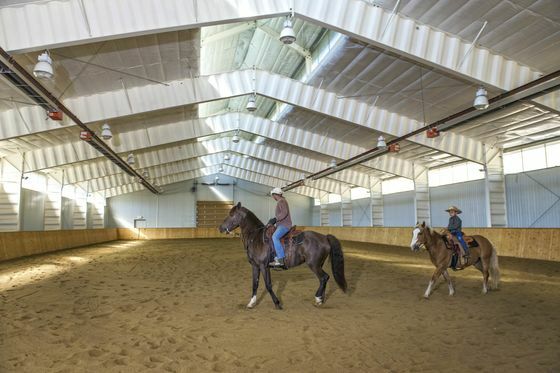 There’s a large indoor riding arena, 10-stall stable (separate from the attached one previously mentioned), and miles of riding trails, which the Blakes made with wood chips from felled pine trees on the ranch. 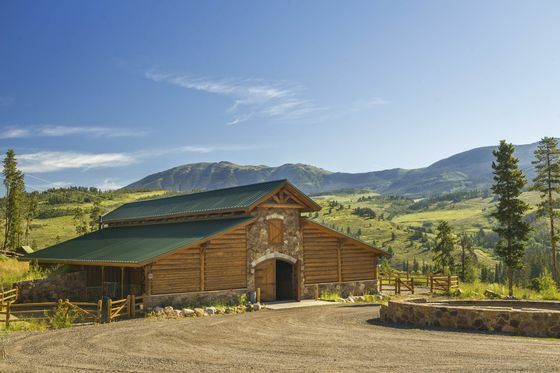 There are other maintenance buildings and staff quarters, including a three-bedroom ranch manager’s house at the property’s entrance, a refurbished barn with its own apartment, and an equipment shed that houses tractors, their boat, and other machinery. The houses are reached by a 2-mile-long road that snakes halfway up the property. 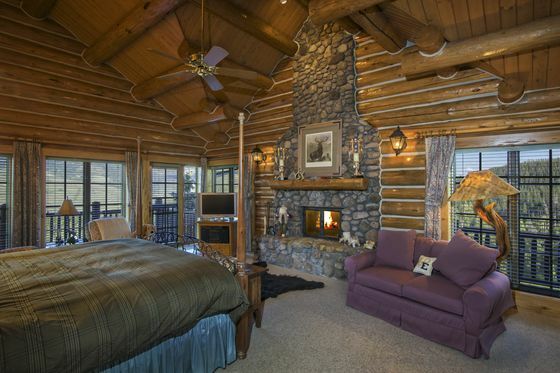 The “guest house” is 7,500 square feet and has six en suite bedrooms, which include a master bedroom and a two-bedroom mother-in-law apartment. (The mother-in-law apartment has its own kitchen and living area.) The guest house, the Blakes say, is the grander of the two homes. It has a lodgelike, open-plan living area with a cathedral ceiling. The main house, which the Blakes live in, is more homey, they say. 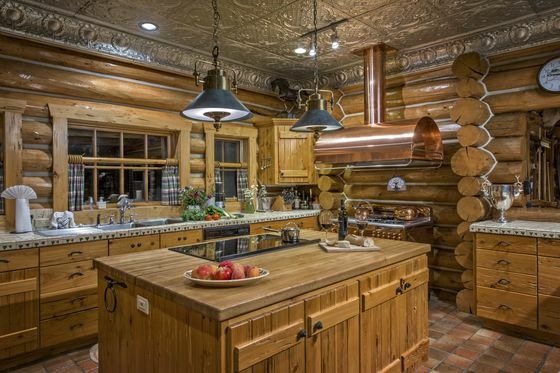 It’s slightly smaller—under 7,000 square feet—though it also has six bedrooms. “When people visit us,” Blake says, “we show them both homes and we ask each of them: If you were us, which would have chosen to live in?” Answers, he says, are split 50/ 50. “They just have a different feel,” he explains. 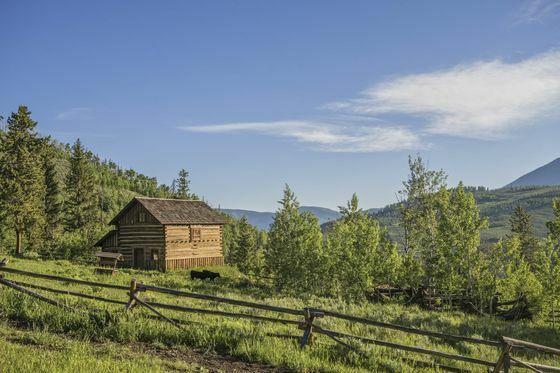 There’s also a restored cabin, which Blake calls a “a big wooden tent for the grandchildren,” and a winterized log cabin used by workers on the ranch. 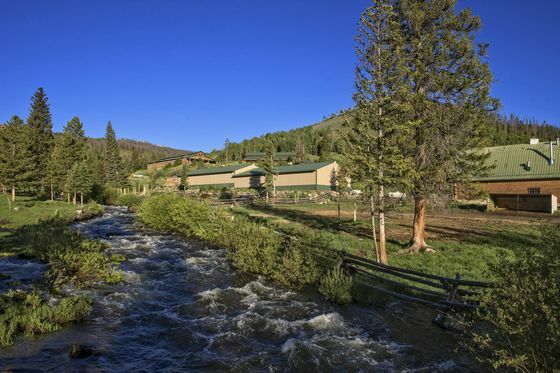 Most of the property is uninhabited, with several creeks that run through it, seven ponds, rolling fields, and aspen groves. With the exception of 60 cows that graze on the property and wild turkeys (the Blakes bred the turkeys themselves, “but they’re so doggone good we don’t ever see them anymore”), the ranch is an oasis of calm. “It’s not unusual, when you wander out and keep quiet, to see both elk and moose,” he says.